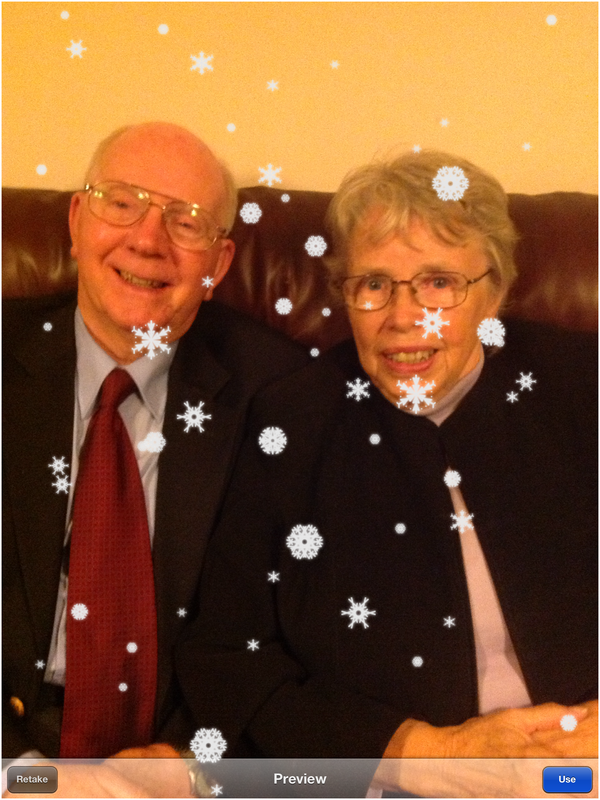 Snow Creator is a fun little app that allows you to create your very own snowflakes, and then watch them fall on your family and friends. Not only that, but you then get to add a quick message and share it with other using Facebook, Twitter, Sina Weibo or via email. You can of course also save it into your own photo album. Creating the snowflake is as simple as drawing lines on the page. You just place your finger at the start of a line, and drag it to the end. 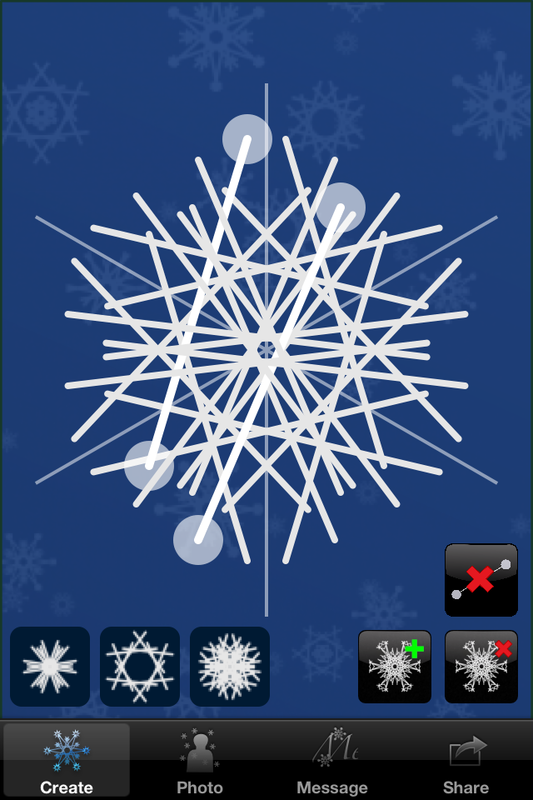 The line you draw will then be mirrored across 6 planes to give you a perfect snowflake. While it may look messy up close when you look at it below at its natural size it is just beautiful. 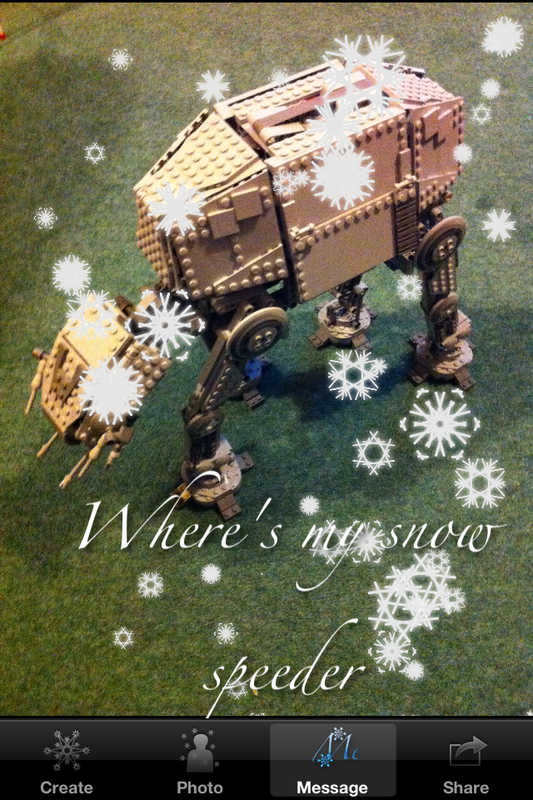 Once you have your snowflakes created you can move onto the second Photo tab. Here you will see the output of the camera with the snowflakes falling in front of the scene with all of your beautifully designed snowflakes. If you rotate the screen, the snow will continue to fall down. When the picture is taken, the snowflakes will freeze in place. If you don’t like it, just take another photo and get them in a new location. You can type in your message, and then position it around the screen and use two fingers to resize the text too. The text will appear on the screen in a beautiful script font, with a small drop shadow allowing it to show up on light or dark backgrounds. You have lots of options to now share your photo. You will require iOS 5 or later to use Twitter sharing, and iOS 6 or later to use Facebook or Sina Weibo. Snow creator works best on the newer iPhones and iPad, and the snow falling can be juddery if you have other apps running. Please note that as I don’t have access to a Sina Weibo account I have been unable to test this functionality, but it should work. If you are able to access a Sina Weibo account and encounter issues then please inform me and I will do my best to get it working. Thanks.